demanding fast and accurate lip synchronization for off-line production. ProductionSync automatically detects and marks events in a voice recording. These events include words, lip positions, and production commands. By providing a rapid and automatic mechanism for detecting these events, ProductionSync allows for automation of some of the most tedious parts of the production process. 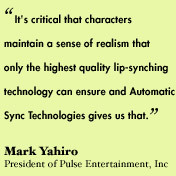 ProductionSync allows an animated characters lip movements, facial expressions, and gestures to be automatically aligned and synchronized to its voice track. ProductionSync can operate either with or without the text script of the voice track available. Synchronized virtual agents for delivering pre-produced content such as animated emails, personal assistants, sales reps, CRM agents, greeting cards, etc. less than 1 second to many hours. Very fast: 60 seconds of audio takes about 2 seconds to synchronize on a 3 GHz P4. Intel-optimized versions are available for even faster performance on Intel processors. Very compact: executable footprint can be as small as 200k. Very accurate: mouth positioning requires little or no manual touch-up. 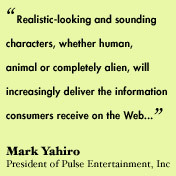 Very fast turn-around: align animation content and production cues with speech files faster than real time. Rapid, low cost translations of existing animation content into new languages. Reduces reliance on specialized expertise for synchronization.